Netflix will add to its App Store offerings later this summer, when it releases a new app for the iPhone. Previewed during Monday’s Worldwide Developers Conference keynote, the movie rental service’s app will provide the full Netflix experience: you can stream video (over Wi-Fi and 3G), view recommendations, browse genres, and access your queue. 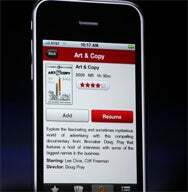 The iPhone app will provide the “same service on your TV, iPad, or laptop,” Netflix CEO Reed Hastings said Monday. Hastings appeared onstage during Steve Jobs’s WWDC keynote to preview the Netflix iPhone offering. He noted that the iPad version, released in April, has been a resounding success, sitting near the top of list of apps most downloaded. Customer ratings are also very positive, Reed said. The iPhone app will use HTTP adaptive streaming to improve video quality. As they can already, Netflix subscribers will be able to start watching a video on their TV, computer, or iPad, and then resume watching later on a different device, including the iPhone. There is no official word on the release date. But Netflix for iPhone will be free of charge at the App Store.